June is Acne-Awareness month (though let's be honest, we'd all like to erase acne from every face on earth!) so we're taking your questions about the skin concern and helping you on the path to clear skin. We had two questions on the gloProfessional Facebook page that our National Educator and glo therapeutics Product Development guru tackled, but we thought we'd share them here too, in case you missed them! Haylee asked: "Just wondering if your Clear Skin Kit would dry out normal/dry skin types? My skin is in this bracket but it's also prone to breakouts so it's hard to find something that isn't too drying but also does the job." We answered: If your skin is "normal" and you have occasional breakouts, then they are probably hormonal. Are they primarily around your chin? For this type of problem it's better to use products that are recommended for combination skin such as our Purifying products. 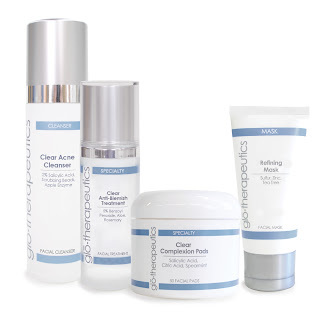 We recommend that you use the Clear Anti-Blemish Cleanser and Anti-Blemish Treatment during the monthly breakouts and then discontinue use when your skin settles down. This will prevent you from getting too dried out." Brenda asked: "Which is better, Purifying products or Clear products? I have sensitive skin and moderate acne which seems to get worse with more products I use, especially acne medications." We answered: You may be over-drying your skin. That could account for some of the sensitivity. Overuse of some ingredients can actually worsen skin. Start with the Purifying products and see if they balance you out. Remember to hydrate the skin daily with Oil Control Emulsion - it's important to do this so the skin doesn't overcompensate for the dry surface by producing more oil. Once you have used these products for awhile, you can step up your treatment (if needed) by adding the Clear Complexion Pads or the Anti-Blemish Treatment as a spot treatment for blemishes." We hope that helps not just Haylee and Brenda but anyone else with similar questions, too! Of course, if you're working on improving your skincare routine but you want to fake flawless instantly, check out our award-winning mineral makeup, glo minerals. It nourishes and protects while providing blemish-who?-beautiful skin. That's a clear skin match made in heaven!